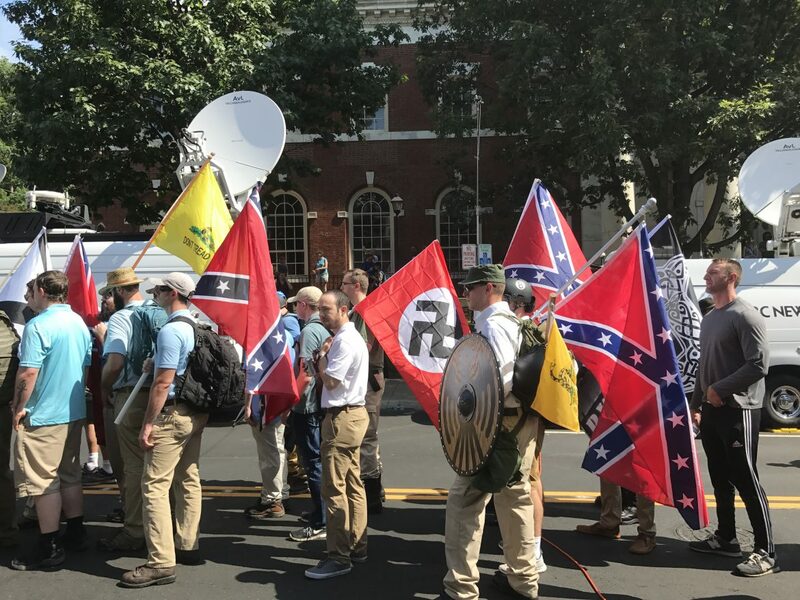 Image from Unite the Right rally in Charlottesville, August 2017, courtesy of Anthony Crider/Flickr. Trump’s lying is the mask of nihilism that reinforces the ideological architecture of neoliberal fascism. Under such circumstances, the state is remade on the model of finance, all social relations are valued according to economic calculations, and the dual project of ultra-nationalism and right-wing apocalyptic populism merge in an embrace of a toxic and unapologetic defense of white supremacy. Unsurprisingly, Trump views language as a weapon of war, and social media as an emotional minefield that gives him the power to criminalize the political opposition, malign immigrants as less than human, and revel in his role as a national mouthpiece for white nationalists, nativists, and other extremist groups. Unconcerned about the power of words to inflame, humiliate, and embolden some of his followers to violence, he embraces a sadistic desire to relegate his critics, enemies, and those considered outside of the boundaries of a white public sphere to zones of terminal exclusion. In this instance, truth when aligned with the search for justice becomes an object of disdain, if not pure contempt. Without a care as to how his own vicious and aggressive rhetoric has legitimated and galvanized acts of violence by an assortment of members of the “alt-right,” neo-Nazis and white supremacists, Trump refuses to acknowledge the growing threat of white nationalism and supremacy, even as he enables it with his discourse of walls, alleged invading hordes, and celebration of nativism. Trump remains silent about the fringe groups he has incited with his vicious attacks on the press, the judiciary and his political opponents. That is, he refuses to criticize them while shoring up their support by claiming he is a nationalist and surrounding himself with people like Stephen Miller who leaves little to the imagination regarding his white supremacist credentials. Trump told reporters after the Christchurch massacre that white nationalism both in the United States and across the globe was not a serious problem. In this instance, he appears clueless and incapable of empathy regarding the suffering of others, all while accelerating neoliberal and racist policies that inflict massive suffering and misery on millions. Violent fantasies are Trump’s trademark, whether expressed in his support for ruthless dictators or in his urging his followers at his rallies to “knock the crap out of” protesters. We have seen this celebration of violence in the past with its infantile appeal to a hyper-masculinity and its willingness to engage further in genocidal acts.